A lovely concept of how to shift negative emotions and actions is to focus on each chakra center and apply a system of inversion to the negative feeling housed there. Begin by recognizing how you may be caught in a negative emotion or action that limits your access to balance, stunts your health, or interferes with your prosperity. Each energy center –>chakra, corresponds to a negative energy state and the capacity for a positive blossoming energy shift. and the seventh chakra, violet: anger/acceptance. To shift your perspective first discover which energy center appears to be out of balance then apply the positive empowering action to shift the negativity and create balance in that center. Your first internal response will be a release, a lessening, a flexibility, and a sense of peace. You will experience a deeper sense of strength and flexibility and an outer sense of lightness and peace. You can also use the colors to help you resonate with the chakra energy centers. Using meditation and breathwork breathe into the space in your body that is being stagnated or blocked with the corresponding color to help cleanse out the negativity and re-energize the center. 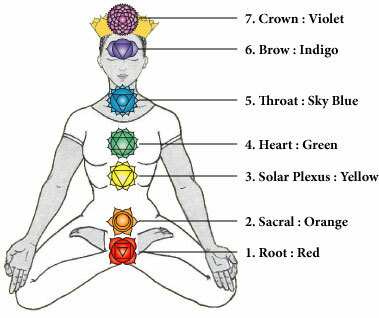 The spaces that correspond with the chakras begin at the base of your spine, then the area just two inches below your belly button, the third is your solar plexus, just under your ribs at the center of your body, the fourth energy center is on your breastbone between your breasts, the fifth is your throat, the sixth your third eye which is the space between your eyebrows and the seventh is at the top of your head in the center – your crown chakra. Your first picture of yourself is from your interactions in your family, peers, and lovers. This idea of reflection being the way in which you see your self is a longstanding tenant in sociology and psychology. The concept of a mirror reflecting to you your personality and self picture is the earliest style of seeing your true nature. A deeper style of connecting with self is to have a knowing from within that is separate from the concept of reflection in relationship. This is related to your personal sensory guidance system. Over my lifetime I have had the distinct honor of learning about chakra imbalance and balancing through my relationships. When struggling with postpartum depression I learned the valuable lesson of taking action in response to fear…sometimes going toward the source of my fear, actually stepping into that which I was fearing to see through the mindset of fear, into the strength of empowered, responsive action. In my lonely, isolated childhood I learned the power of integration which required dealing with my low-self-worth and the importance of pulling on my non-judgmental posture and a reframing of hopelessness to unconditional love. These lessons have powered the long positive train of amazing, productive and fulfilling relationships in my life. To shift into mindfulness I endeavored to continually shift my negative speech to positive speech reframing, inverting, and freeing every negative thought like butterflies and wildflowers; from this stance in the world compassion, inner truth and outer prosperity are my constant companions and experiences. In my loneliest times, when I felt deeply bereft I turned to creativity, painting, sculpting, gardening, and writing to allow my grief to spill out and be replaced with strength, renewal, and joy. And finally, that unpleasant and undignified friend anger – through my acceptance I experienced the power of my true self –> the reality of what was became the ground upon which I built a bigger, better, more beautiful Tao. Discover your inner radiance and rainbow of energy. Heal yourself through breath, color, and relationship by shifting negativity to prosperity through these active shifts in being and responding in your relationships and within yourself. Namaste, in love and light, bg. Categories: Balance of Spirit Mind and Body category, consciousness development, Mindfulness living category, Paradigm shifting | Tags: attitude of gratitude, balance, chakras, consciousness development, health, instinctive health, internal sensory guidance system, mind-body-spirit connection, overcoming poor self esteem, paradigm shifting, responsible action | Permalink. Anger, fear, discouragement, and insecurity have oxidative properties to your spirit, mind and body. When you choose a path that brings you strength, empowerment, joy, and confidence you are creating anti-oxidant properties that regenerate your cells, your thinking power, and your spiritual health. This is a natural outcome of mindfulness and mindful meditation, focused breathwork, and heart or breath-led yoga practice. I have a neighbor who cannot let go of any perceived injury. She plots and plans to get back at any individual who in her mind has ‘injured’ her. These perceived injuries feel very painful to her. Her face carries the look of a person who has been in battle for many years; deep furrows between her brows as if in a perpetual frown, loose skin that has deep furrows around her mouth make her look as if she is angry when she is at rest. Strangely, or perhaps understandably because she is always looking for injury, she has difficulty with any service professional who comes into her home… either she feels they are cheating her or they overcharge her or they do not correctly complete every job assigned. This spills off onto the constant negative, fearful energy of her constantly, fearfully barking tiny dog who seems to be in a constant panic attack. This woman actually has a great deal of prosperity in her life which she appears to not receive any comfort from. She owns her home and another rental (of course her tenants are always taking advantage of her from her perspective), has a good job and a nice retirement pension coming her way…. yet she is not happy – she is rich in things but poor in her sense of wealth and her style of relating in the world. This is an example of how the oxidative energy of vengefulness, anger, and dissatisfaction are wearing away at her wellbeing. She cannot experience the comfort she actually has, and her face and body show the signs of advanced aging so that she looks older than her years. Even when she chooses to smile the anger and dissatisfaction comes through. Regardless of another’s choice you are free to choose your own way. If another indeed is harming you or injuring you with his or her actions, taking a step to set it right is good. Do so with a lack of vengefulness or anger in your ideation, intention, and action. This will keep your cells vibrant, your face and voice and heart glowing and bring prosperity to you. This is healthy living and results in vibrant health in your spirit,mind, and body. If you have been drawn in to a difficult relationship. Give yourself a chance to re-choose and to set your intention on this joyful path. You can always choose a different path, a different response. When are able to act in this loving responsible way, even saying you’re sorry when you make a mistake and resetting your plan, you teach your children to be resilient, flexible and truly responsible… and you build your own inner resilience. Categories: Balance of Spirit Mind and Body category, coaching category, consciousness development, Mindfulness living category, personal development category, professional development category, spiritual development | Tags: attitude of gratitude, balance, change, faith, health, inner balance, instinctive health, internal sensory guidance system, mind-body-spirit connection, non-violent discipline techniques, overcoming poor self esteem | Permalink. When What You Believe Matters! I am excited to share about a new book out there called I Believe: When What you Believe Matters! by Eldon Taylor. What I like about it is that it offers lots of studies and examples of how your beliefs drive what you create. It has a lot of the great tools found in Esther Hicks’ books but with a scientific component that really brings substance to the material. Everyone is extolling praises for this book, including famous personalities such as Lindsay Wagner, John Gray, Ph.D., James Van Praagh, Larry Dossey, M.D., and Stanely Krippner, Ph.D. I know you will find this book valuable, both personally and for your own business. The information in this book is consistent with the information you find in my writings about the importance of congruence in your thinking and actions and mindfulness. I Believe: When What You Believe Matters! reveals the importance of choosing your every life belief and the effects these choices have on the quality of your life, impacting areas that may surprise you in ways you have not thought of. Eldon Taylor even shows how these belief choicepoints can influence how long you will live and how your DNA expresses itself. Your belief paradigms affect what you will allow yourself to see and hear; each belief effecting many consequences. He talks about it like a spider web that continually builds upon itself often trapping us where we don’t want to be. Categories: Balance of Spirit Mind and Body category, Mindfulness living category | Tags: attitude of gratitude, consciousness development, instinctive health, mindfulness, overcoming poor self esteem, paradigm shifting | Permalink. Hi, Welcome and thanks for your interest! Soul guidance is a set of 5 easy steps to shift your focus so that you can have your heart center guide your path. Anxiety and guilt wreak havoc on the human spirit and lead to breath-holding, inflexibility, and burning off of true soul guidance. 3rd Discern which aspects of your inner sensory guidance system reveals intuition and which reveal fear -here are the most common: Fear: pit of stomach tightness-fear, anxiety in chest breath holding-fear, inflexibility in hips-fear (trauma), inability to think clearly and utilize mindfulness-fear Intuition: quiet light voice in the center of your being-intuition – may be in you heart or your mind, this has a sense of ringing clear through your spiritual, emotional physical field – it allows openness, neutrality, space, and mindfulness. Breath is the key. Breathing through to trust and have faith in your knowing requires deep full breathing drawing into you the power of the knowing. Breathing through as you release the fear, allowing it to disconnect from you, letting go as you release the lack of power. Love the simplicity? It’s all within you, pay attention when something seems to go in crooked or doesn’t feel right or causes you to withdraw – this is a message from your sensory guidance system. Respond accordingly. Engage your critical thinking and your mindfulness, and respond to what you discover. When you feel stuck, unworthy, anxiety or fear, breathe, and go through these steps to release the fear and embrace your inner knowing. Listen to your true voice – the sound will be sure and firm, loving and compassionate, light and quiet. Ignore the loud fear-filled, guilt-filled, anxiety voice. Avoid defensiveness deciding your course of action. Choose the sweet loving inner smile of love and joy – live there and everything you desire will be at your fingertips to create. Categories: Balance of Spirit Mind and Body category, coaching category, consciousness development, Gestalt figure ground, Mindfulness living category, personal development category, spiritual development | Tags: attitude of gratitude, balance, change, consciousness development, discipline, faith, freedom, healing, inner balance, instinctive health, lovingkindness, mind-body-spirit connection, namaste, overcoming poor self esteem, upleveling | Permalink. Habits and paradigms are tricky. A habit can be defined as something that guides you toward success or shifts you into a rut out of which you are always struggling to evolve. Paradigms give you your first structure of morality, right/wrong stories, and modes to interpret the world. Habits and paradigms work right up to the point they become obsolete. When you feel stuck or clinging to a habit or paradigm that feeling may be a sign that you need to birth through to the next way. Challenging your paradigmatic perspective including your habitual reaction patterns allows you to discover a deeper and fuller experience in your relationships and work environment. Not long ago I encountered a dead-end on my path. At least I thought that was what it was at the time. I had gone as far as I could in the pursuit of something. I had reached a stopping point but not reached the goal. At least that stopping point didn’t look like my picture of the goal. I felt discouraged. I didn’t want to turn around and go back, but I could go no further. So I sat down where I was. I stopped pushing. I looked around. I looked within. I began breathing and focusing on what I felt as well as what I saw. With my breath and focus the energy around me shifted. It was as if I was vibrating into a new level of consciousness. As I sat there I felt inconsolable. I had become attached to the goal I was pursuing. At first my attitude didn’t allow for me to see anything positive. I could only see through the eyes of my disillusionment. Then I began to see through an attitude of gratitude. I began to notice some wondrous things around me: extraordinary relationships and family; time and freedom to pursue my dreams; support; love; space; an inner awareness. This awareness, breath, gratitude, and peacefulness filled me and opened up an inner imaginal world filled with plausible creations. I realized the dead-end was a logical conclusion of my limited thinking and perception – an inner shifting of paradigms and habits. It wasn’t that I hadn’t reached the goal, it was that my goal had transformed. I had shifted from pursuing an independent, proving, route to experiencing and developing a collaborative, integrative, holistic, path. This required me to shift my perspective, my habits, and my capacity to take in what was around me, to see through a different lens. At once, with this realization, I noticed a beautiful path that veered off just to edge from my sitting place. It was a slightly elevated pathway that was not immediately noticeable, hidden from view when looking straight ahead or downward. It was light and airy, covered in a material that was vastly different from the path on which I had been walking. I could only see the way, through my new perspective of present moment now and receiving joy. The hard work, perseverance, and hard choices, the trauma and difficulties of my youth had created a primary paradigm that anything of worth required this set of behaviors. And that I had to prove who I was, a doing, rather than being style of living. What I had endured to get to this point could only bring me this far on my path. Only via these new lessons of ease, joy, laughter, love – that lovely concept of flow could I see the way through. An evolution of consciousness was the action required to take my next step. And this evolution comes from a releasing, a relaxing, and a letting go rather than a persevering, pushing attitude. The shift in consciousness creates the new paradigm in a quantum-style movement, rather than a linear movement. Each new paradigm births through its predecessor through a natural shifting of perspective. Categories: Balance of Spirit Mind and Body category, coaching category, consciousness development, Gestalt figure ground, Mindfulness living category, Paradigm shifting, spiritual development | Tags: attitude of gratitude, balance, change, consciousness development, discipline, faith, freedom, inner balance, insecurity, instinctive health, meditation, mind-body-spirit connection, overcoming poor self esteem | Permalink.